Today I finished the swimsuit I was making! It was a little hard to get used to sewing with and stretching the lycra, and inserting elastic was really hard at first. I learned that you should follow the directions the the T concerning the elastic, even if they seem weird and unnecessary! :-) I did change on thing concerning the elastic though. I made a casing and fed the elastic through for the shorts waistband, instead of zigzagging it to the fabric, and then turning it under. In some places the elastic doesn't look perfect, but all in all, I think it turned out well! I modified the swimsuit a little, lengthening the bodice (since I'm on the tall side), skirt, and shorts a bit. I also sewed the skirt to the bodice, instead of leaving them separate. I left the bodice to hang down and tuck into the shorts, so the swimsuit shouldn't come up while swimming! In addition, I used 4-way-stretch lycra for the lining as well, since I had plenty of it, and didn't want to fuss with swimsuit lining fabric. Also, since I got a great deal on fabric off ebay, I didn't want to have to buy even more fabric! A tip, if you're going to buy lycra fabric, check ebay first! The best I could find on online fabric stores was lycra for $10 a yard! However, I got 4 yards off of ebay for $18, and that included shipping! $4.50 per yard is a whole lot better than $10 per yard, and ebay had a great selection! I made the skirt knee-length, so that I'll be comfortable wearing it in and out of water. Plus, I won't have to wear shorts while swimming, I'll just wear the swimsuit, making swimming more comfortable. I also like that it's higher necked then most! Though it didn't turn out perfectly, it's very comfortable, and I'm glad I made it! You can find the pattern here. 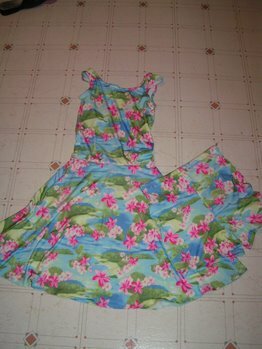 Here's pictures of my swimsuit, one with me wearing it, along with a blouse that matches perfectly, and one of just the swimsuit. I really like the fabric, it has my favorite color in it! You did a great job, Anna! Your swimwear is very pretty and modest, something you can't find in a swimsuit anymore. I just might have to order that pattern! In the pattern, the bodice was really long, and tucked into the shorts and skirt, which were connected together. 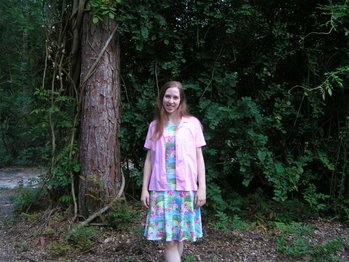 I prefered a not-tucked in look, so I sewed the skirt and bodice together, leaving the long bodice that hung down to tuck into the shorts, underneath the skirt. I was kinda upset when I realized that I'd have to pay $40 for fabric, kind of expensive for a swimsuit! Then on a whim, I decided to check ebay, and I'm so glad I did! Yes, shorts are heavy, but I hope the skirt isn't too heavy... I guess I'll just have to wait and see! sorry, Jen! I don't have any pictures from yesterday! Unless... Miriam, did you take any? I'd like copies if you did! As soon as Elijah shows me how to make the DVD of the recital, I'll send you one though Jen! That is a great swim suit, and very modest! It looks fairly comfortable too. I love your swimsuit! I may have to get that pattern someday. I don't do much swimming now, though, so I don't really have a need to make one currently. I just wear a regular one-piece suit with knee-length culottes and a lycra tanktop for my swim outfit now. Your is so much more pretty and feminine, though. I love the fabric pattern :). What are all the sizes the pattern comes with? Michele, it comes in Ladies' sizes 6-14. Miriam, that's okay. I guess people on here will just have to go without pictures! okay, that swimsuit is absolutely ADORAABLE!!!! I LOVE IT, and especially the fabric! You may have converted me, I think I need one! Anna, thought you didn't know it, you were really asking if I (your sister Miriam) took pictures of your dance recital. I did though I don't have them with me here at work. I'll try to email them to you tomorrow! okay, thanks Miriam! Mom had said that Miriam had taken a picture of a certain thing... and I immediately just assumed she was talking about Miriam Hart! :-) Oh the mixups we get into! Anyways, thanks ahead of time for the pictures!